Enas E.A., Hancy Chennikkara Pazhoor MD, Arun Kuruvila MBBS, Krishnaswami Vijayaraghavan MD F. Intensive Statin Therapy for Indians:Part I Benefits. Indian Heart Journal. 2010;(In press). Enas E.A., Hancy Chennikkara Pazhoor MD, Arun Kuruvila MBBS, Krishnaswami Vijayaraghavan MD F. Intensive Statin Therapy for Indians:Part II Risks Indian Heart Journal. 2010;(In press). Enas EA. Singh V, Munjal YP, Gupta R, Patel K. Recommendations of the Second Indo-US Health Summit on the prevention and control of cardiovascular diseases among Asian Indians. Indian Heart J 2009;61:265-74. Enas EA, Singh V, Munjal YP, Bhandari S, Yadave D, Manchanda S. Reducing the Burden of Coronary Artery Disease in India: Challenges and opportunities. Indian Heart J 2008;60:161-175. Enas EA. Why Indians are more susceptible to coronary artery disease: Role of special risk factors. Cardiological Society of India Annual Scientific Sessions supplement 2007, Hyderabad. Enas EA. Diet and cardiovascular disease. An update Cardiological Society of India Scientific Annual Scientific Sessions supplement 2007, Hyderabad. Enas EA, Mohan V, Deepa M, Farooq S, Pazhoor SG, Chennikkara H. Metabolic Syndrome among Asian Indians: A population with high rates of diabetes and premature heart disease. J CardioMetabolic Syndrome 2007;2:267-275. Enas EA. Dyslipidemia in the South Asian patient. Current Atherosclerosis Report. 2007;9:367-374. Enas EA, Chacko V, Senthilkumar A, Puthumana N, Mohan V. Elevated Lipoprotein(a)-A Genetic Risk Factor for Premature Vascular Disease in People With and Without Standard Risk Factors: A Review. Dis Mon 2006;52:5-50. Bhalodkar NC, Blum S, Enas EA. Accuracy of the ratio of triglycerides to high-density lipoprotein cholesterol for predicting low-density lipoprotein cholesterol particle sizes, phenotype B, and particle concentrations among Asian Indians. Am J Cardiol 2006;97:1007-9. Enas EA. Dyslipidemia among Indo-Asians: Strategies for identification and management. Brit J of Diabetes and Vascular Dis 2005;5:81-90 (Review). Superko RH, Enas EA, Kotha, P, Bhat N, Garret B. HDL subclass distribution in individuals of Asian Indian decent: The National Asian Indian Heart Disease Project. Preventive Cardiology 2005; 8:81-6. Bhalodkar NC, Blum S, Rana T, Bhalodkar A, Kitchappa R, Enas EA. Effect of leisure time exercise on high-density lipoprotein cholesterol, its subclasses, and size in asian Indians. Am J Cardiol 2005;96:98-100. Bhalodkar NC, Blum S, Rana T, Kitchappa R, Bhalodkar AN, Enas EA. Comparison of high-density and low-density lipoprotein cholesterol subclasses and sizes in Asian Indian women with Caucasian women from the Framingham Offspring Study. Clin Cardiol 2005;28:247-51. Enas EA, Senthilkumar A, Chennikkara H, Bjurlin MA. Prudent diet and preventive nutrition from pediatrics to geriatrics: current knowledge and practical recommendations. Indian Heart J 2003;55:310-38 (Review). Enas E A, Senthilkumar. Coronary Artery Disease In Asian Indians: An Update And Review . The Internet Journal of Cardiology 2010;1:avaible at www.The Internet Journal of Cardiology accessed Dec 1, 2010. Enas EA Senthil kumar A. Lipopprotein(a): Reality and relevance. In: Gambhir DS, ed. Cochin: Cardiological Society of India, 2002. Enas EA, Senthilkumar A, Mathai A. Statins in the prevention and treatment of coronary artery disease: Closing the knowledge and treatment gap. Asian J Clin Card 2002;6:8-28. Enas EA, Senthilkumar A. Conquering the epidemic of coronary artery disease among Indians: crucial role of cardiologists. Cardiology Today 2001;5:282-294. Hoff JA, Senthilkumar A, Enas E, Kondos G. Prevalence of Coronary artery calcification in Asian Indians and Caucasians. Circulation 2002;106 (supl):3650A. Enas EA, Senthilkumar A, Juturu V, Gupta R. Coronary artery disease in women. Indian Heart J 2001;53:282-292. Enas EA. Lipoprotein(a) is an important genetic risk factor for premature coronary artery disease in Asian Indians. Am J Cardiol 2001;88:201-202. Enas EA. Medical treatment of coronary artery disease: focus on statins- the underused wonder drugs. In Rao GHR. Ed. 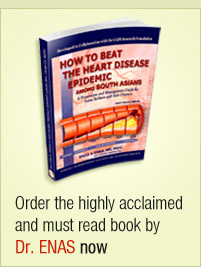 Coronary Artery disease in South Asians. New Delhi 2001;243-252. Enas EA. Arresting and reversing the epidemic of CAD among Indians. In Kumar Anil Ed. Current Perspectives in Cardiology. Chennai 2000: 109-128. Enas EA. Coronary artery disease epidemic in Indians: A cause for alarm and call for action. J Indian Med Assoc 2000;98:694-702. Enas EA, Shibit T, Antony J. Paradigm Change from palliative to preventive cardiology: A critical review of mechanical coronary interventions versus comprehensive medical management. Asian J Clin Cardiol. 2000; 3:21-52. Enas EA. From intervention to prevention of CAD. Proceedings of the Nutrition Society of India. National Institute of Nutrition. Hyderabad 1999.11-32. Enas EA. Testing for the efficacy of lipid-lowering therapy versus revascularization: The time has come or is it past due? Circulation. June 1998. Enas EA. High rate of CAD in Asian Indians in the United States despite intense modifications of life style: What next? Current Science June 1998. Enas EA. Why is there an epidemic of CAD in young Indians? Asian J Clinic Cardiol April 1998. Enas EA. Management of coronary risk factors: Role of life style modification. Cardiology Today. Jan 1998. Anand S, Enas EA, Yusuf S. Lipoprotein levels in South Asians in North America. Metabolism. 1998;47:182-184. Enas EA. Coronary artery disease in Kerala: double jeopardy from nature and nurture. Indian Medical Association, Kerala State XL Annual Conference – 1998, Kodungalur; 73:81-89. Enas EA. Lipoprotein(a) and coronary artery disease in young women: A stronger risk factor than diabetes? Circulation. 1998;97:923–925. Enas EA. Preventing death in patients with coronary artery disease. Cardio. January- March, 1997; 30-35. Enas EA. Alcohol and cardiovascular mortality in US physicians – is there a modifier effect by low density lipoprotein? Arch Intern Med. 1997:157;1769-70. Enas EA. Risk of primary and recurrent myocardial infarction from lipoprotein(a) in men and women. J Am Coll Cardiol. 1997;29:887. Enas EA. Prevention and treatment of coronary artery disease. J Asso Phy of India.1997;45:309-315. Enas EA. Medical treatment of Coronary Artery Disease; Focus on Statins: The underused miracle drugs. Proceedings of the Second International Symposium of Atherosclerosis, Thrombosis and Transfusion Medicine. Ashoka Hotel, Bangalore, India. December 19-21, 1996. Enas EA, Dhawan J, Petkar S. Coronary artery disease in Asian Indians: Lessons learnt and the role of lipoprotein(a). Indian Heart J. 1997;49:29 – 34. Enas EA, Yusuf S, Mehta J. Meeting of International Working Group on coronary artery disease in South Asians. Indian Heart J. 1996;48:727 – 732. Abate N, Garg A, Enas EA. Physio-chemical properties of low density lipoproteins in normolipidemic Asian Indian men. Horm Metab Res. 1995; 27: 326-331. Enas EA. Coronary Artery Disease in Asian Indians. Handbook for Asian Indians, 1995-96:83 – 84. Enas EA. Cooking oils, cholesterol and coronary heart disease. Indian Heart J. 1996;48:423 – 428. Madhuri V, Yagalla MV, Hoerr SL, Song WO, Enas EA, Garg A. Relationship of diet, abdominal obesity, and physical activity to plasma lipoprotein levels in Asian Indian physicians residing in the United States. J Am Dietetic Assoc. 1996;96:257-261. Enas EA. Avoiding premature coronary deaths in Asians in Britain: guidelines for pharmacological intervention are needed. BMJ. 1996; 312:376. Enas EA. Rapid angiographic progression of coronary artery disease in patients with elevated lipoprotein (a). Circulation. 1995; 92:2353-54. Enas EA, Mehha J. Malignant atherosclerosis in young Indians: Thoughts on Pathogenesis, prevention and treatment. Clinic Cardiol. 1995; 18:131-135. (Review). Enas EA, Yusuf S, Garg A, Davidson L, Thomas J, Pearson TA. Lipoprotein (a) levels in Indian physicians: comparison with white and black physicians in the USA. Indian Heart Journal 1994;46(suppl):185. Enas EA. Prevention of heart attack in Indians. J Am Assoc Phys of Indian Origin. 1993;6:23-24. Jha P, Enas EA, Yusuf S. Coronary artery disease in Asian Indians: Prevalence and risk factors. Asian Am & Pacific Islander J of Health 1993;1:163-175.(Review). Enas EA, Yusuf S, Mehta J. Prevalence of coronary artery disease in Asian Indians. Am J Cardiol 1992;70:945-949.(editorial). Enas EA, Davidson ME, Nair V, Yusuf S. Prevalence of coronary heart disease (CHD) and its risk factors in Asian Indian migrants to the United States. 9th International Symposium on Atherosclerosis. Rosemont, IL, International Atherosclerosis Society 1991;267. Davidson ME, Enas EA, Thomas I. High prevalence of low HDL-C levels and other dyslipidemic disorders in Asian Indians in the United States.” Proceedings of the National Conference on Cholesterol and High Blood Pressure Control, Washington, DC; April 1991. Enas EA, Thomas I. Immigrant Indian males – sitting ducks for heart attacks: A cause for alarm and call for action. J Am Assoc Phys of Indian Origin. March 1990;2:15-18.